Products CAD software development The more highly automated your manufacturing, the more benefit our innovative project development programs can provide. Download the latest ProjectViK releases, and stay up to date on new capabilities. Customer support. Find answers to questions and explore support offerings. ProjectVik2011 is an application on the basis of AutoCAD used to design external pressure and gravity pipeline networks, particularly, water mains and sewerages. 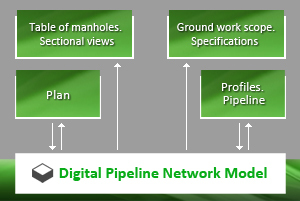 ProjectVik2011 is based on a unique method of creating a digital pipeline network model (DPNM). A group of designers gradually creates the digital model and makes alterations to it in the process of work on the project. DPNM technology ensures control of collisions, coordination of all the drawings of the design, specification and other reports in accordance with the alterations. This ensures consistency and integrity of the whole project. The source data of DPNM are the networks themselves as well as manholes and other objects drawn in the network. If the objects are edited in the drawings, the application will update the DPNM. Not to limit the user’s possibilities in AutoCAD. One can edit everything in every possible way. To use AutoCAD graphic primitives familiar to users. To automate all routine operations which do not require a creative approach of the designer. Use ramp-loading technique and dynamic tests for convenient work and early error detection. The third generation of industry-leading platform for designing of main pipelines.